Background/Purpose: TNF inhibitors (TNFi) are recommended for patients with axial SpA (axSpA) who do not respond to or tolerate NSAIDs. Some patients are inadequate responders or intolerant to TNFi and this axSpA population has not been exclusively studied in a clinical trial. In COAST-W (NCT02696798), we investigated the efficacy and safety of ixekizumab, a high-affinity monoclonal antibody that selectively targets IL-17A, in patients with active radiographic axSpA (r-axSpA) with prior inadequate response (IR) or intolerance to 1 or 2 TNFi. Methods: In this randomized, double-blind, placebo-controlled, Phase 3 trial, adult patients with IR/intolerance to 1 or 2 TNFi and an established diagnosis of r-axSpA (patients fulfilling ASAS classification criteria for axSpA, with radiographic sacroiliitis centrally defined by modified New York criteria) were recruited and randomized 1:1:1 to placebo (PBO) or 80-mg subcutaneous ixekizumab every 2 (IXEQ2W) or 4 (IXEQ4W) weeks, with either 80-mg or 160-mg starting dose (assigned 1:1). The primary endpoint was ASAS40 response rate at Week 16. Secondary outcomes and safety were also assessed. Categorical outcomes were analyzed by logistic regression with non-responder imputation. Continuous outcomes were analyzed by mixed-effects model of repeated measures except MRI SPARCC scores (analysis of covariance using observed case without imputation). Results: In total, 316 patients were randomized to PBO (N=104), IXEQ2W (N=98), or IXEQ4W (N=114). All patients possessed very active (mean BASDAI: 7.4±1.3) and longstanding disease (median duration of symptoms = 16.7 years); 90% had a prior IR and 10% were intolerant to TNFi. At Week 16, significantly higher proportions of IXEQ2W (N=30 [30.6%]; p=0.003) or IXEQ4W (N=29 [25.4%]; p=0.017) patients achieved ASAS40 versus PBO (N=13 [12.5%]), with statistically significant differences as early as Week 1 for both treatment regimens. Significant improvements were observed for disease activity, function, quality of life, spinal MRI inflammation, and high sensitivity CRP (Table 1). The majority of treatment emergent adverse events (AE) were mild/moderate (Table 2). Serious AEs were consistent across arms. 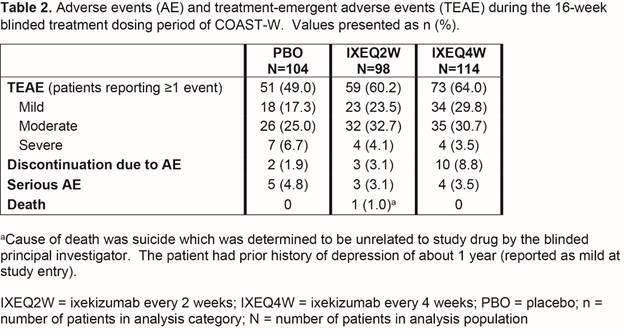 One death was reported (IXEQ2W) due to suicide, which was not attributable to study drug per the blinded principal investigator. Conclusion: Both ixekizumab treatment regimens yielded rapid and significant improvements in the signs and symptoms of r-axSpA at Week 16 in patients with previous IR or intolerance to 1 or 2 TNFi, compared to PBO. Disclosure: A. A. Deodhar, Abbvie, Eli Lilly and Company, Janssen, Novartis, Pfizer, UCB, 2,Abbvie, BMS, Eli Lilly and Company, Janssen, Novartis, Pfizer, UCB, 9; D. Poddubnyy, AbbVie, MSD, Novartis, 2,AbbVie, BMS, MSD, Novartis, Pfizer, UCB;, 5,AbbVie, BMS, Janssen, MSD, Novartis, Pfizer, UCB, 8; C. Pacheco-Tena, None; C. Salvarani, None; E. Lespessailles, None; P. Rahman, AbbVie, Amgen, BMS, Celgene, Eli-Lilly, Janssen, Pfizer, Novartis, Merck, UCB, 5,Janssen, 2,AbbVie, Amgen, BMS, Celgene, Eli-Lilly, Janssen, Pfizer, Novartis, Merck, UCB, 8; P. Järvinen, None; J. Sanchez-Burson, None; K. Gaffney, None; E. B. Lee, None; E. Krishnan, Eli Lilly and Company, 9; S. Santisteban, Eli Lilly and Company, 9; X. Li, Eli Lilly and Company, 9; F. Zhao, Eli Lilly and Company, 9; H. Carlier, Eli Lilly and Company, 9; J. D. Reveille, Janssen, 5,Eli Lilly and Co., 2, 5,UCB, Inc., 5,Novartis, 5. Deodhar AA, Poddubnyy D, Pacheco-Tena C, Salvarani C, Lespessailles E, Rahman P, Järvinen P, Sanchez-Burson J, Gaffney K, Lee EB, Krishnan E, Santisteban S, Li X, Zhao F, Carlier H, Reveille JD. 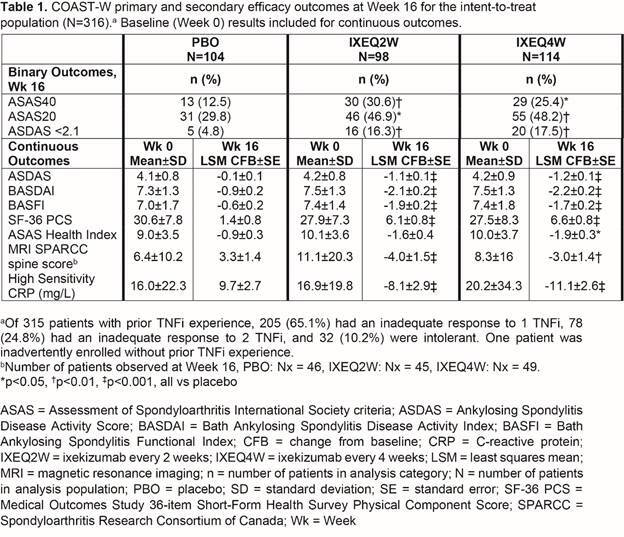 Efficacy and Safety of Ixekizumab in the Treatment of Radiographic Axial Spondyloarthritis: 16 Week Results of a Phase 3 Randomized, Double-Blind, Placebo-Controlled Trial in Patients with Prior Inadequate Response or Intolerance to 1 or 2 Tumor Necrosis Factor Inhibitors [abstract]. Arthritis Rheumatol. 2018; 70 (suppl 10). 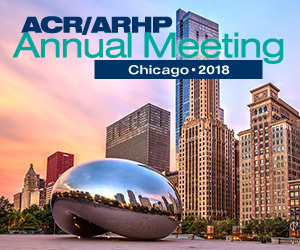 https://acrabstracts.org/abstract/efficacy-and-safety-of-ixekizumab-in-the-treatment-of-radiographic-axial-spondyloarthritis-16-week-results-of-a-phase-3-randomized-double-blind-placebo-controlled-trial-in-patients-with-prior-inade/. Accessed April 20, 2019.